Kids suffering from Cerebral palsy may soon have a powerful new Physical therapy technique in the form of robotic assistance for their legs. A study is being conducted on the potential benefits of the system, newly adapted for the use of children. Lokomat is a “robotic gait training program” that’s been around for a couple of years, but mainly used by adults. As any doctor will surely tell you, treating kids is a whole different process — and not just because they’re smaller. Just like in school, motivation and attitude need to be considered more closely. At the university, the researchers conducted a little photo op and press event to show off the device. 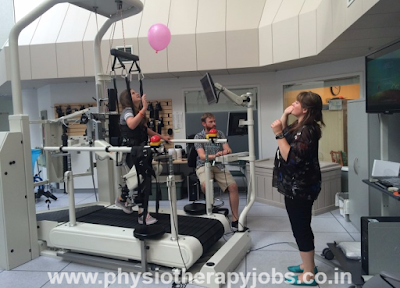 12-year-old Maggie Slessor, who suffers from a form of cerebral palsy, demonstrated the Lokomat with the help of her physical trainer. The legs support the user’s body weight while guiding them through the ordinary motions of walking; this reduces or eliminates the need for the person to hold onto something while they walk — potentially providing a big morale boost. That’s especially important with children. The study will be the largest randomized, controlled trial yet to evaluate the effectiveness of robotic gait assist, but the “qualitative” aspect of it is also new. Even if it were to only have a minimal effect on the physical side, it could still be a major success on the psychological front. Work has just begun, and the study is expected to last five years and involve at least 140 kids. Good science takes time, after all. News Compiled by Physiotherapy Jobs Portal www.physiotherapyjobs.co.in , India's first and exclusive registered Job Portal for Physiotherapists since 2010.